Harsh weather, hard work and lots of washing can eventually take a toll on hands, causing dryness and even painful cracking. Creams help soothe chapping and cracking, but avoiding harsh cleansers and hot water relieves severely dry hands even faster. Gloves and mittens protect your hands from drying out in winter, while a moisturizing sunscreen prevents dryness and sun damage in summer. Washing with alcohol-based soaps in hot water is extra drying for cracked hands -- that goes for waterless soaps, too, since they're full of alcohol. Keep the water cool to lukewarm whenever you wash your hands and use alcohol-free soap to keep your hands protected. Thick hand cream or lotion is a must for severely cracked, dry hands. Fragrance-free or sensitive-skin formulas won't irritate chapped skin, but if you have open cracks, cover them with a dot of antibiotic ointment and an adhesive bandage before you lotion up. For best results you can apply a thick coat of cream and then wear moisture-infused gloves to bed. 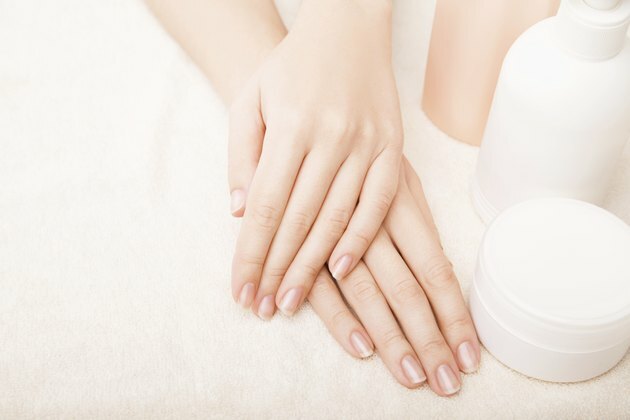 Your nails and cuticles are just as prone to dehydration as the rest of your hands. Dry skin around the nail bed can result in painful hangnails, which are actually bits of dried-out dead skin. Olive oil or cuticle cream dabbed around each nail will soothe cracking and help heal dry skin.